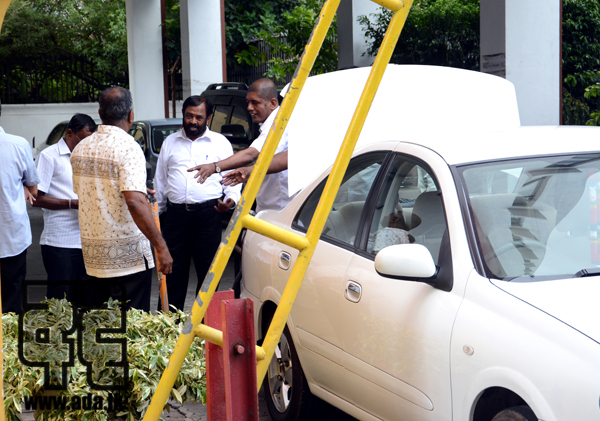 The inquiries into the complaints received against doctors have been hindered as a Chairman of the Sri Lanka Medical Council (SLMC) has not been appointed yet says the Registrar of SLMC Dr Terrence Gamini de Silva. Already, complaints against 10 doctors have been received but they cannot be investigated as SLMC has not had a Chairman since 30th June. 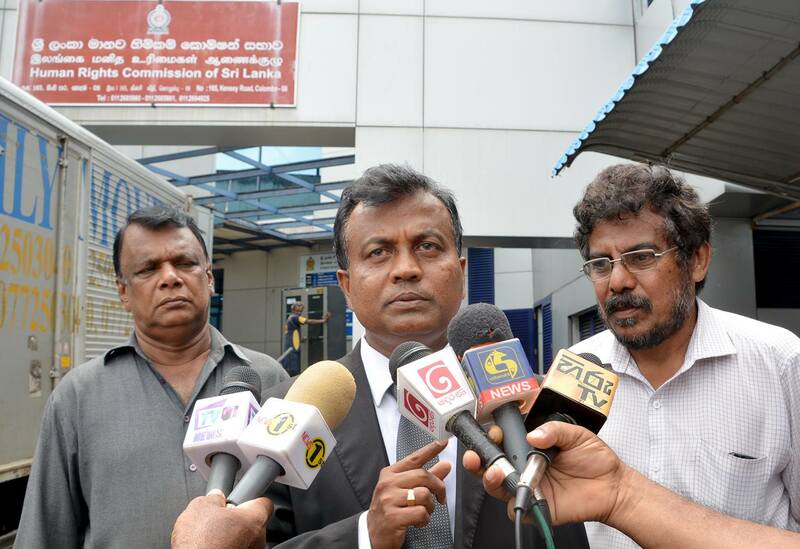 Prof Carlo Fonseka was the Chairman of SLMC and his term ended on the 30th June. The Local Government (LG) Elections Amendment Bill was passed in Parliament a short while ago with 120 MPs voting for it. The bill was passed with 120 voting in favour and 44 abstaining while no votes were cast against the bill. However, none of the MPs voted against the Bill. MPs representing the Joint Opposition were among those who abstained from voting on the bill. The two ministerial portfolios fell vacant due to ousting of Mr Wijedasa Rajapaksha from the cabinet have been given to the Minister of Foreign Employment Thalatha Athukorala and Minister of Sustainable Development and Wildlife Gamini Jayawickrama Perera. Ms Thalatha Athukorala was sworn in today (25th) before the President as the Minister of Justice and Mr Gamini Jayawickrama Perera was sworn in as the Minister of Buddha Sasana. Mr Wijedasa Rajapaksha was removed from the portfolios on a charge of violating collective responsibility of the cabinet. 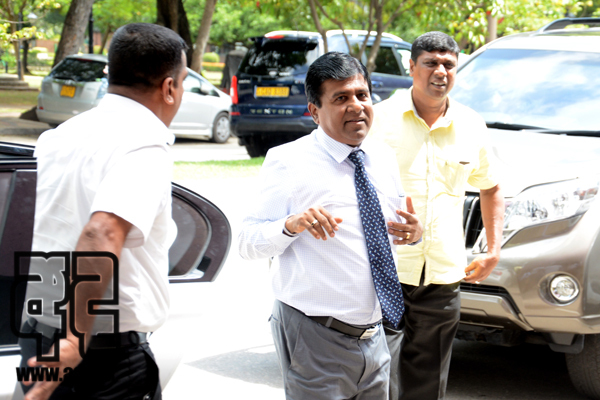 24 appointments made to the State Pharmaceuticals Manufacturing Corporation without any concern regarding their qualifications by the Minister of Health, Nutrition and Indigenous Medicine Dr. Rajitha Senaratne have been suspended and the Corporation has been ordered to inspect their qualifications by the Committee On Public Enterprises (COPE). 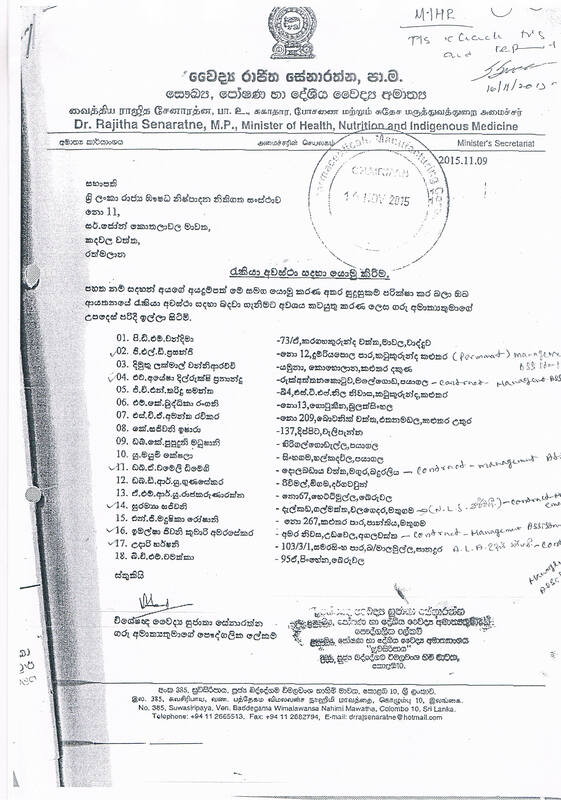 Instructions had been given to recruit the employees in a letter using the letter heads of the Ministry of Health, Nutrition and Indigenous Medicine and the signature of Specialist Doctor Sujatha Senaratna, wife of Minister Rajitha Senaratna, who acts as his private secretary. 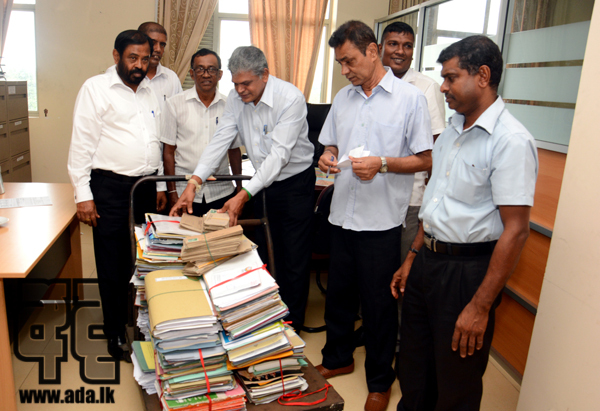 Most of these appointees are from Wadduwa, Katukurunda, Bulathsinhala, Badureliya areas in Kalutara District and three of them have been attached as coordinating secretaries to Minister Senaratna. As such, they had drawn salaries from the State Pharmaceuticals Manufacturing Corporation while employed as Minister Senaratna’s coordinating secretaries. It is revealed that there are no provisions to attach employees recruited to the State Pharmaceuticals Manufacturing Corporation for any other duties and doing so is illegal. It has also been revealed to COPE that 6 employees recruited in this manner to State Pharmaceuticals Manufacturing Corporation have drawn salaries without reporting to any duty at the Corporation. Also, 18 of this group have been recruited on 9th November, 2015 but the approval of the Director Board had been received only on 18th May, 2016. This means they have been appointed before receiving the approval of the Director Board. As such, their appointments have been suspended so that their qualifications and the process they were recruited could be investigated, to find out how some of them have drawn salaries without performing any duties and how they had functioned as coordinating secretaries of the Minister when there are no provisions for such a process. The draft bill for the 20th amendment to the constitution was tabled in Parliament today (23rd). The Bill presented was approved by the cabinet on the 20th. According to the Bill, the number of parliamentary seats increases to 237 from the current 225. 145 MP will be elected under the first-past-the-post (FPP) system and 55 under the district proportional representation (PR) system. 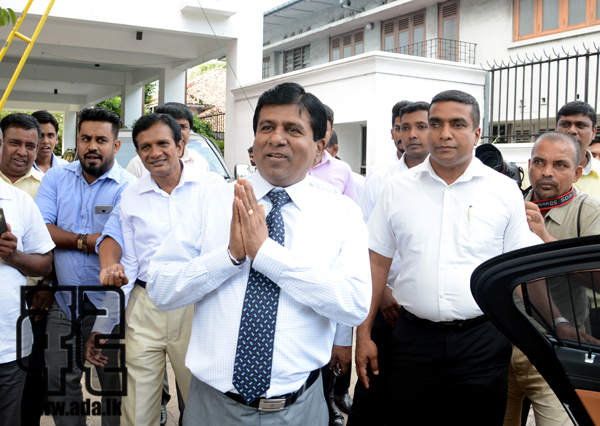 According to President’s Media Division, President Maithripala Sirisena has decided to remove Minister Wijeyadasa Rajapakshe from his ministerial portfolio. According to the Media Division, the President has already conveyed the decision to the Minister. 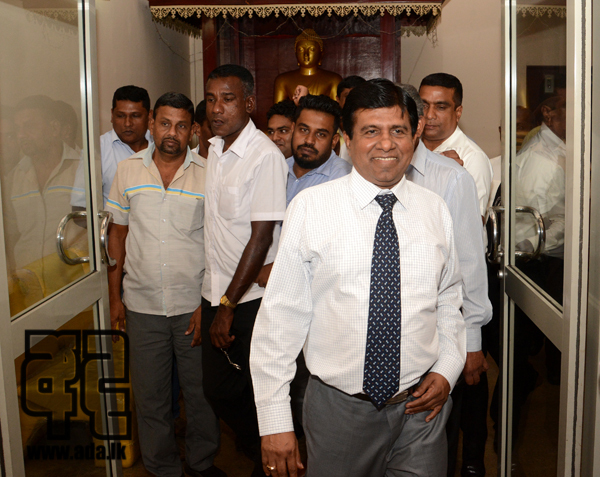 The UNP Working Committee yesterday (22nd) unanimously decided that Minister of Justice and Buddha Sasana Wijeyadasa Rajapakse should be removed from all his ministerial portfolios. 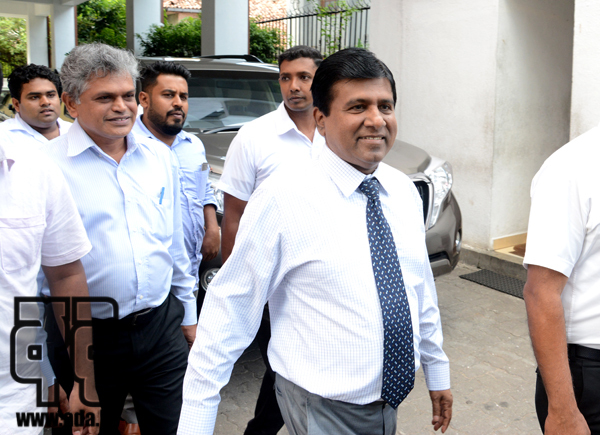 Former Governor of the Central Bank Ajith Nivard Cabraal has been summoned to Bribery Commission He arrived at the Commission a short while ago today (23rd). He has been summoned by the Commission to make a statement over an ongoing investigation.